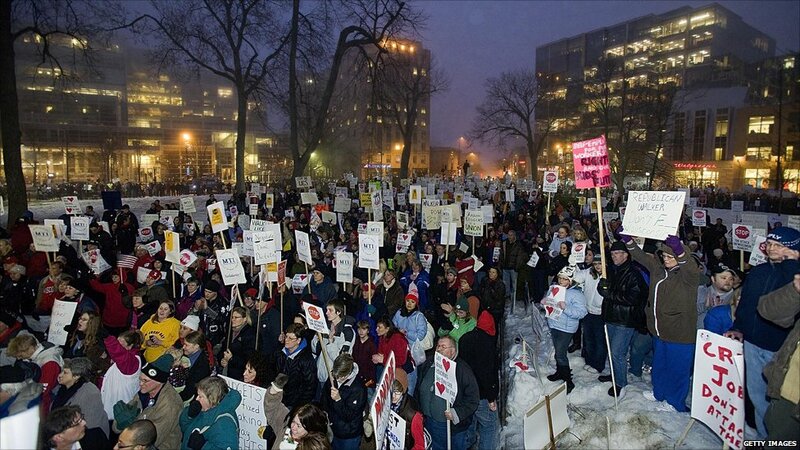 In Wisconsin, teachers, prison guards, firefighters, students and others have been protesting against the Republican-led government's plan to curtail public employees' right to collective bargaining and have them pay more for healthcare and pensions. 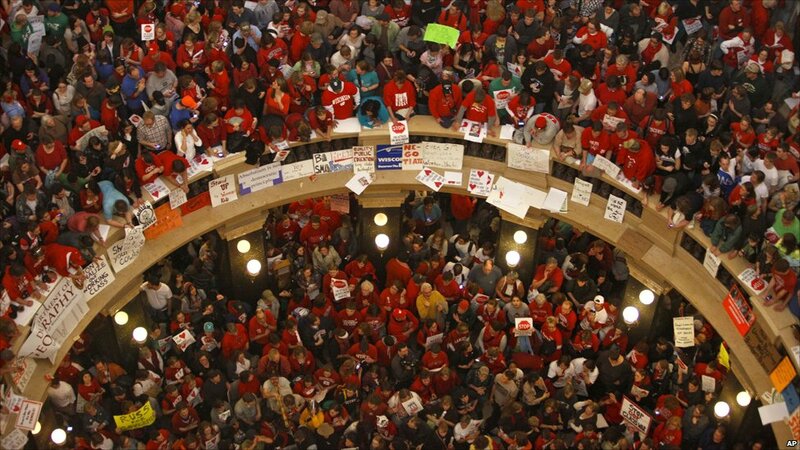 The protesters crowded inside the state capitol building to oppose the legislation, which they described as an attack on their livelihood and an attack on the unions. 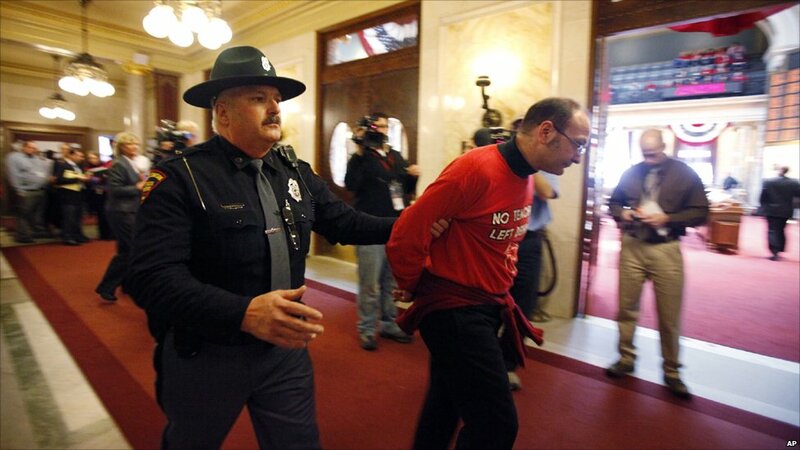 ...but was arrested by a police officer. 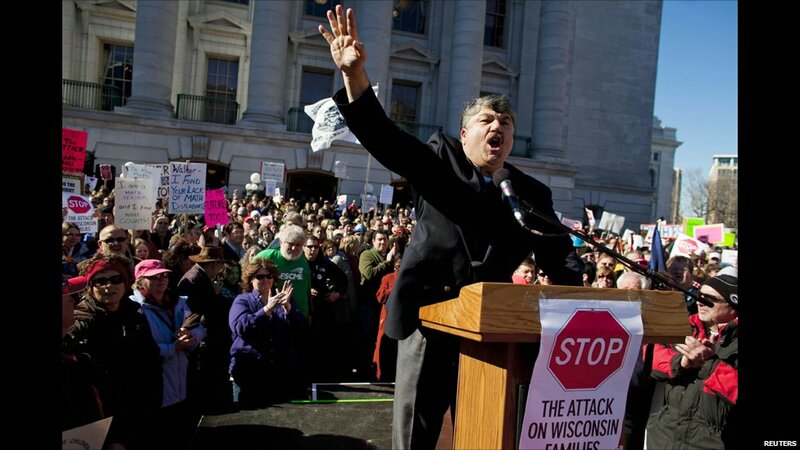 Democratic senators opposed to the legislation have left town, denying the state senate a quorum for a vote on the issue in the hope of forcing the governor and Republican legislators to negotiate. 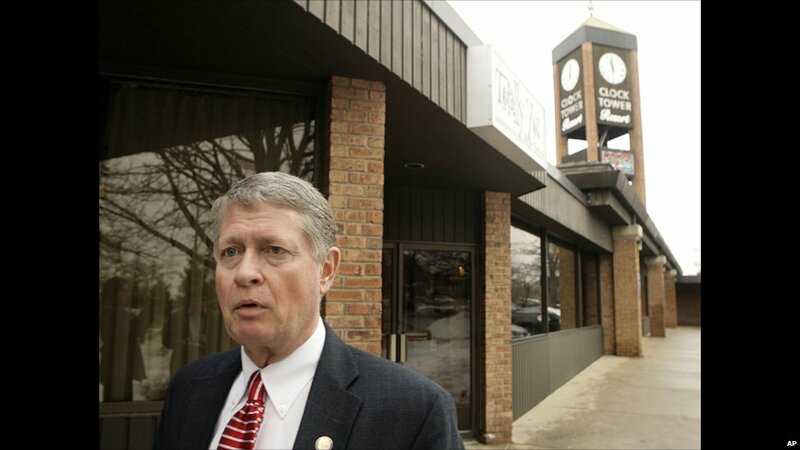 Democrat Jon Erpenbach is staying at a hotel in Chicago, about three hours away. There he said: "We all didn't want to do this. I didn't want to do this." 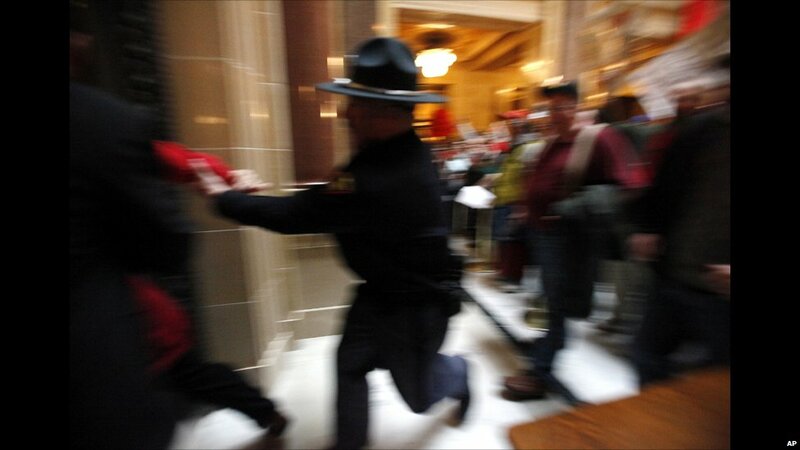 Back in Wisconsin, the Senate Democratic minority leader avoided state troopers sent to his home. 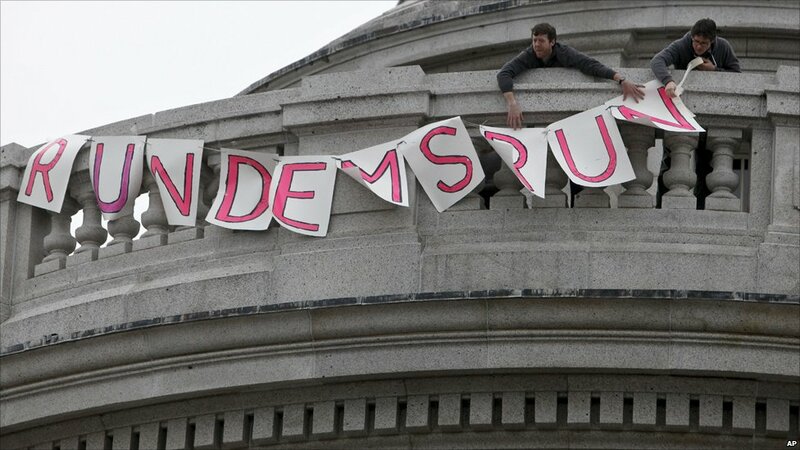 The protesters cheered the Democrats' move, here unveiling a banner urging "Run Democrats, run". Republican Governor Scott Walker urged them to return: "The state senators who are hiding out down in Illinois should show up for work, have their say, have their vote, add their amendments, but in the end, we've got a $3.6bn (£2.23bn) budget deficit." 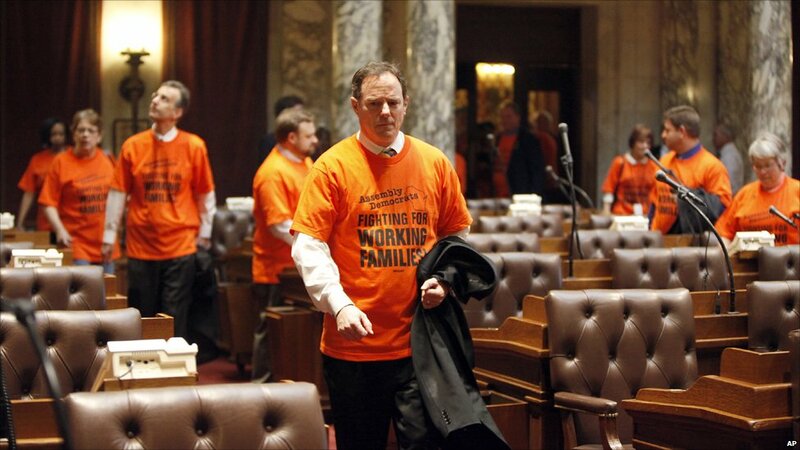 Democrats in the state Assembly, the lower house of the legislature, wore orange shirts in support of the protesters. But Republicans hold a 60-38 majority in the chamber, with one independent.